Have you always had a problem selecting the best filtration gear that will go with your plumbing pump? Your luck is about to change with the high end UltraKlean T 3500 Filtration Kit from Aquascape. This eliminates all guesswork pond owners are fond of making when trying to pair up the pump and its respective filter. 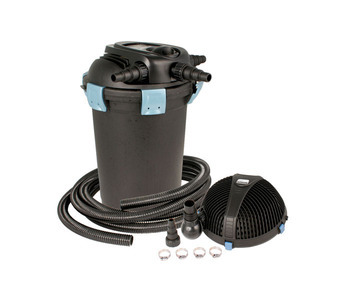 This UltraKlean T 3500 Filtration Kit from Aquascape comes in three available sizes that means there will always be an ideal filter kit for any pond configuration. Not only is this UltraKlean T 3500 Filtration Kit selected by Aquascape for all-sizes ponds, they have also matched the components that will help the UltraKlean T 3500 Filtration Kit work efficiently when making the right pump-filter match. 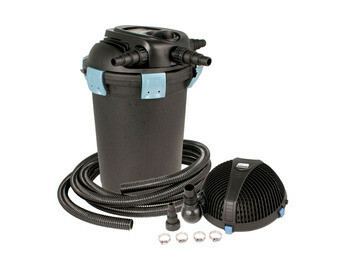 When you purchase the UltraKlean T 3500 Filtration Kit from Aquascape, you will receive a kit that includes an UltraKlean T 3500 pressure filter, high standard kink-free pipe, 28-watt UV clarifier integrated on the pressure filter, a 2-way control valve and a stainless steel clamp for the hose. The UltraKlean T 3500 Filtration Kit can fulfill filtration needs to a maximum of 3,500 gallons of pond water. The UltraKlean T 3500 Filtration Kit from Aquascape is what you should be looking for when you experience problems pairing up your pump to the right filtration equipment.